"Cronulla" redirects here. For other uses, see Cronulla (disambiguation). Cronulla is a beachside suburb, in Sydney, in the state of New South Wales, Australia. Cronulla is located 26 kilometres south of the Sydney central business district, in the local government area of the Sutherland Shire. Cronulla is located on a peninsula framed by Botany Bay to the north, Bate Bay to the east, Port Hacking to the south, and Gunnamatta Bay to the west. The neighbouring suburb of Woolooware lies to the west of Cronulla, and Burraneer lies to the southwest. The Kurnell peninsula, the site of the first landfall on the eastern coastline made by Lt. (later Captain) James Cook in 1770, is reached by driving northeast out of Cronulla on Captain Cook Drive. Cronulla is derived from kurranulla, meaning ‘‘place of the pink seashells’’ in the dialect of the area's Aboriginal inhabitants, the Gweagal, who were a clan of the Tharawal (or Dharawal) tribe of Indigenous Australians. They were the traditional custodians of the southern geographic areas of Sydney. The beaches were named by Surveyor Robert Dixon who surveyed here in 1827-28 and, by 1840, the main beach was still known as Karranulla. In July 1852 the schooner Venus was wrecked on the beach, which was referred to in newspaper reports as Cooranulla. Matthew Flinders and George Bass explored and mapped the coastline and Port Hacking estuary in 1796 and the southernmost point of Cronulla is named Bass and Flinders Point in their honour. John Connell received a grant of 380 acres (1.5 km2) in 1835. Thomas Holt (1811–88) owned most of the land that stretched from Sutherland to Cronulla in the 1860s. Holt built Sutherland House on the foreshore of Gwawley Bay in 1818, on the eastern side of Sylvania. In 1888 master mariner Captain Joseph Henry Rounce Springall became the pioneering resident of Cronulla when, with his family, he constructed the two storey 'Oriental Guest House' on land above where today's North Cronulla Hotel sits. The Depression of 1890 and a lack of reliable transport access from Sutherland saw "The Captain's" pub sold. The Cronulla area was subdivided in 1895 and land was offered for sale at 10 pounds per acre. In 1899, the government named the area Gunnamatta, which means sandy hills. On 26 February 1908 it was officially changed to Cronulla and Gunnamatta was used for the name of the bay, on the western side. After the Illawarra railway line was built to Sutherland in 1885, the area became popular for picnics and swimming. Steam trams operated between Cronulla and Sutherland from 1911. Many regulars rented beach houses at Cronulla every year for school holidays. The Oriental Hotel was built by Captain Spingall in 1888, on the present site of apartments behind the North Cronulla Hotel. The Cecil Hotel was located on the foreshore of South Cronulla and the Ritz Café was popular with holiday-makers. The Cecil Apartments were built on the former site of this hotel. The steam trams were replaced by the Cronulla branch of the Illawarra railway line when it opened in 1939. The post office opened in January 1891, known as Cronulla Beach, but closed in 1893. It reopened in 1907 and the name was officially changed to Cronulla in 1929. The Cronulla School of Arts was established in 1904. The original wooden building was demolished and replaced by the current School of Arts building in November 1912, and is now one of the oldest buildings in Cronulla. The first public school opened in 1910. From the 1950s, many of the guest houses began being replaced by high rise flats. Even though it developed as a residential area, Cronulla remained popular with beachgoers and tourists. Several hotels, motels and serviced apartments operate today. The Cronulla Bicentennial Plaza opened in February 1989. In 2005 the beachfront at Cronulla was the scene of widely publicised mob disturbances and violent confrontations. These incidents continued over a number of days and also spread to other areas in Sydney. Cronulla is a popular tourist attraction and attracts many beachgoers from all over Sydney. Cronulla Beach features a long stretch of sand that runs from Boat Harbour to North Cronulla, followed by rock pools and another sandy beach at South Cronulla. The beaches of Cronulla from north to south are: Boat Harbour, Wanda Beach, Elouera Beach, North Cronulla Beach, Cronulla Beach, Blackwoods Beach, Shelly Beach and Oak Park. 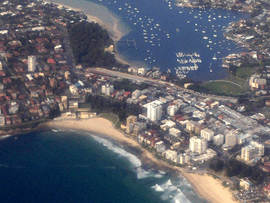 Local names also apply to various parts of the beach, such as The Alley, between Cronulla Beach and North Cronulla, The Wall, between North Cronulla and Elouera, Midway, between Elouera and Wanda, and Green Hills, to the north of Wanda, Sandshoes, near the mouth of the Port Hacking estuary, Voodoo Reef and The Point. The beaches are popular recreational areas for swimming, surfing, bodyboarding, bodysurfing and other water sports. Shark Island, just off Cronulla Beach, is a famous surfing and bodyboarding spot, and the site of the annual Shark Island Challenge bodyboarding contest. Gunnamatta Bay provides protected swimming at the baths off Gunnamatta Park. Port Hacking is a popular location for such water sports as waterskiing and wakeboarding. Bass & Flinders Point is the southernmost part of Cronulla and features a monument to explorers George Bass and Matthew Flinders, who explored the Port Hacking estuary. Darook Park, Gunnamatta Park and Tonkin Park are all located on Gunnamatta Bay. Cronulla Park is located behind the beach at South Cronulla. Dunningham Park sits behind the beach at North Cronulla, shaded by large Norfolk Island Pines. It features a children's playground, picnic tables and a kiosk. Monro Park, featuring the Cronulla War Memorial, is located opposite Cronulla railway station. Don Lucas Reserve is located beside the car park at Wanda Beach, popular for sport and recreational activities such as flying kites. Shelly Park sits behind Shelley Beach. The main shopping strip runs along Cronulla Street, which has been partly converted into a pedestrian mall known as Cronulla Plaza. It also extends along the Kingsway, Gerrale Street and other surrounding streets. Cronulla has developed a café culture, with some cafés and restaurants located along the North Cronulla foreshore and Cronulla Plaza. Tourists can choose from a number of hotels, motels and serviced apartments. 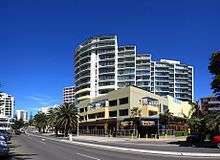 Cronulla has many attractions including a cinema, restaurants, nightclubs, pubs and bars. Trains terminate at Cronulla railway station on the Cronulla branch of the Illawarra line, on the Sydney Trains network. Cronulla Tunnel Gallery is just north of the station, linking Cronulla Street to Tonkin Street. Cronulla and National Park Ferry Cruises runs passenger services around Port Hacking and a regular route between Cronulla and Bundeena, on the edge of the Royal National Park. The Cronulla Ferry wharf sits on Gunnamatta Bay, beside Tonkin Park. Transdev NSW operates several bus routes that stop at Cronulla Railway Station. For full details of all bus services see Cronulla Station. The local National Rugby League football club is the Cronulla-Sutherland Sharks. The Cronulla-Sutherland League's Club and home ground, Endeavour Field, are located on Captain Cook Drive at Woolooware. Cronulla-Sutherland Junior Baseball Little League represented Australia in the 2015 Little League World Series where they had a record of one win and two losses. Surf lifesaving clubs are located along the beach at Wanda, Elouera, North Cronulla and South Cronulla. Many soccer clubs are located in the Cronulla district, the most prominent being Cronulla Seagulls and the Cronulla RSL clubs. Surfing plays a major role in Cronulla. Famous professional surfer and 1999 world champion Mark Occhilupo ('Occy') grew up surfing in Cronulla. Many surfboard shapers hand craft their surfboards in Cronulla and the Sutherland Shire and Cronulla Beach holds the Australian Boardriders Battle on Australia Day. The annual Shark Island Challenge bodyboarding contest and the annual Shark Island Swim Challenge are held at Cronulla Beach. The Cronulla International Cycling Grand Prix has been held in Cronulla since 2006. In 2009 it was also the Australian National Criterium Championships. Cronulla Spring Festival is held every year on the second weekend of September. It includes free entertainment, food and many variety stalls. Opera On the Beach is an event commonly held at Cronulla as part of the nation's Australia Day celebrations. Spokey Blokeys podcast recorded their 17th episode in Cronulla. Puberty Blues is a book and movie about the surfing culture in the Sutherland Shire. An episode of the popular science-fiction TV series Farscape was filmed in Cronulla. The Australia's Next Top Model (Cycle 4) house was situated on Gunnamatta Bay. The Shire, is a reality TV show began being filmed in early 2012, having Cronulla as its main setting. According to the 2011 census of Population, there were 17,042 residents in Cronulla. The most common ancestries in Cronulla were English 29.6%, Australian 26.5% and Irish 10.3%. The most common occupations in Cronulla included Professionals 23.6%, Clerical and Administrative Workers 16.2% and Managers 15.2%. The median weekly household income was $1,455, a little higher than the national median of $1,234. Cronulla's housing was higher density than is usual in Australia, with 71.2% of occupied private dwellings being flats, units or apartments. 1 2 Australian Bureau of Statistics (31 October 2012). "Cronulla (State Suburb)". 2011 Census QuickStats. Retrieved 30 April 2013. ↑ http://www.sutherland.nsw.gov.au/ssc/rwpattach.nsf/0/Factsheet_6_FINAL_20030728.pdf/$file/Factsheet_6_FINAL_20030728.pdf Sutherland Shire Place Names Archived 4 October 2006 at the Wayback Machine. ↑ "Mob violence envelops Cronulla". AAP. 11 December 2005. Retrieved 31 August 2006. ↑ "Now churches are targeted". The Australian. Archived from the original on 16 June 2006. Retrieved 31 August 2006. ↑ "Cronulla". Sydney.com. Retrieved 12 June 2013. ↑ "Events & What's Happening". Thursday 26th January 2012. Cronulla Beach YHA Sydney NSW Australia. Retrieved 12 June 2013. Wikivoyage has a travel guide for Sydney/Cronulla. Wikimedia Commons has media related to Cronulla, New South Wales.